When my wife and I purchased our first house, we wound up with a gorgeous lawn, beautiful shrubbery, fantastic trees and many beds for growing annuals. I almost immediately killed the lawn, my first of many. I don't think I did too much damage to the established plants and trees, but after that first year, the beds were largely just an inadvertent science experiment in which various kinds of weeds battled it out for supremacy, but that initial summer we had a flower garden for the ages. Okay, that may be an exaggeration, but it was my one shining example of gardening success. It was mostly petunias, but in the classic "granny garden" ethic in which I was raised, there were cosmos and daisies and geraniums and lobelia and marigolds and poppies and a little bit of just about everything else that grows here in the Pacific Northwest. I was out there every single day from early Spring through early Fall, watering, weeding, fertilizing, deadheading, and just generally sitting there with my shoes off in the increasingly spotty grass just watching it grow. I learned then, that this is the secret to a successful garden: daily attention. By the following Spring the newness had begun to wear off. I started like a ball-o-fire, but soon found myself resenting the flower bed as much as I had grown to resent the never-ending obligations of mowing, pruning, and raking. But at least I'd learned what it takes, even if it turned out to not be the hobby for me. Like it or not, small schools like ours do tend to take on the strengths and weaknesses of the teacher, especially if that teacher has been there for a long time. Woodland Park has alway had a garden, but for most of my tenure that has meant a handful of plants that thrive on neglect and loads of empty beds that were just perfect for mixing up some mud. When we got serious about the outdoor part of our program 5 years ago, our community reclaimed our old garden space, spruced it up, and declared "gardening" to be part of our curriculum. We always have a number of avid gardeners within our parent community, folks who know what they're doing, and since I'm not one of those, we've relied on the time and energy of those people for whatever gardening success we've had. And while I wouldn't call our preschool gardening a failure, despite good intentions and often yeoman-like efforts, it has never really thrived, at least not as a part of the curriculum. For that, I blame myself. No matter how many willing hands I have to help me, it's my job to "hold the vision," and since my experience in gardening is limited, my vision tends to be fairly limited as well. It probably hasn't helped that we've moved the entire garden, plants and all, three times during those five years: first from the old space to the new, then two years ago from a less than ideal spot to a sunnier spot. But something has happened this year. For one thing, we had a couple of very dedicated gardener parents put their focus on things, digging-in during the early Spring to really fill those beds with a variety of interesting, mostly edible plants, usually working with small teams of children. To a certain degree, this has happened every year, but perhaps the most important thing they've done is to actually keep track of what we've planted and where. And as summer approaches, our garden is turning out to be the place to be. We haven't harvested much food so far, just some snap peas, but we can see things coming: onions, raspberries, strawberries, lettuces and cabbages. 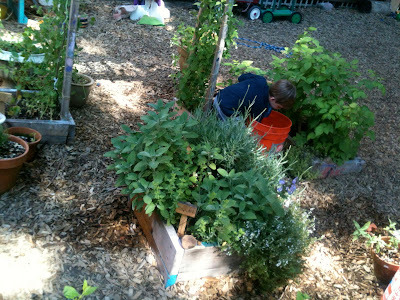 Our herbs are bursting out of their beds and our snap pea vines are starting to climb charmingly over the child-sized archway built for the purpose. Gardening with young children can be a harrowing experience. All it takes is one child, off the radar for a few minutes, to essentially upend all of your hard work. All it takes is one child not understanding the designation between garden bed and pathway. But over the years, my greatest frustrations with gardening and young children is simply that for most of our school year, there isn't much going on out there, and just as things really get going, we break for the Summer, leaving our herbage to an ever-changing group of kids who are only there three days a week. The lessons of the garden, it seemed to me, were those of life cycles, of patience, of consistency, and of gentleness, but our school schedule really isn't set up for that. But this Summer I'm starting to see it differently. As the early Spring work of our gardening parents literally bears fruit, I'm beginning to understand the importance of having a garden in our midst. It's not that we have to bear witness to every stage in the lifecycle of our garden, from sprout to seed, because that is happening all the time, all around us, at homes, in parks, in the woods, and in our school. No, the importance of our garden is to spend time there, puttering around, dropping to our knees and simply being with the plants. Yes, our plants are experiencing a kind of drought-flood cycle right now as the kids water the diddly-o-dandy out of them for our three days on, leaving it to go dry during the subsequent four days. It's good we have well-drained soil in there. Yes, we've tried sprouting our own wheat grass seeds, but that was done in peat pots beside the garden, a place for experimentation, whereas the garden itself is more for exploration. As I mentioned, we have harvested a few snap peas and a couple carrots that wintered over, and we're keeping an eye on our berries, but most of our gardening has been done with our eyes, not our hands. We've played with ladybugs in the garden, releasing them one at a time from the bag of 1,500 we purchased from a nursery. And yesterday, we used acrylic paint pens to decorate the wood of the raised beds, the terra cotta pots, and various rocks and stones; not gardening exactly, but being in the garden, breathing the garden, being with the garden. That was the best part, after all, of my one successful gardening cycle, sitting there in the grass watching the flowers grow. I'm starting to understand that this is what gardening with young children is all about. "You Raise Them To Be Independent"
"All Thin Lips And Flinty Glares"
But Then What Would Happen To Summer?